How to reach us most easily? 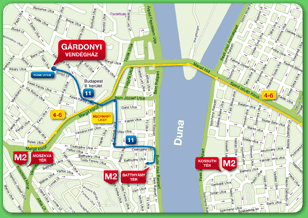 Take either tram line 18, line 59 or line 61 or metro line 2 (M2) till Széll Kálmán tér, where you have to get on tram line 4 or line 6 until you reach Mechwart liget. At Mechwart liget you need to take bus line 11 and get off at Füge utca (1 stop). Take tram line 4 or line 6 until you reach Mechwart liget. At Mechwart liget you need to take bus line 11 and get off at Füge utca (1 stop). 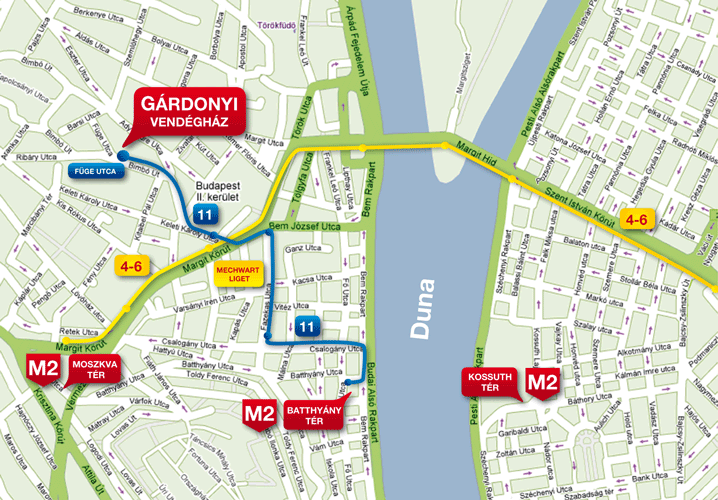 Take metro line 2 (M2) till Batthyány tér where you need to get on bus line 11 and get off at Füge utca (4 stops). Tickets for public transport services can be purchased at underground stations, news stands and ticket vending machines. An 11 passenger Airport Shuttle takes passengers to any destination in the city for a fixed and affordable price. Tickets can be purchased at the Airport Minibus counter.